The benefit of higher seeding rates in terms of suppressing weeds is well documented. In the 1970’s and 80’s during the infancy of no-till, it was commonly recommended to plant 200K soybean seed per acre in narrow rows to enhance weed control. As new, more effective herbicides were introduced those seeding rates were reduced. The current seeding rate recommendations were developed following the introduction of Roundup Ready soybean (DeBruin and Pedersen 2008). Due to the significant increase in soybean seed prices and the simplicity in managing weeds due to the efficacy of glyphosate (it was short-lived), seeding rates were based solely on economic returns. However, due to the spread of herbicide resistance, weed management is no longer simple. Alternative weed management tactics are needed, one relatively easy tactic to adopt is enhanced crop competition. Row spacing, planting density, cultivar characteristics, and row orientation all influence how well a crop suppresses weeds. 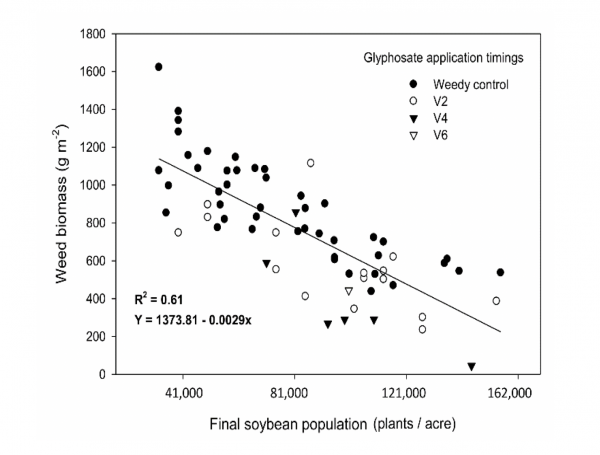 We evaluated the influence of seeding rate in 15” rows on biomass of weeds in glyphosate resistant soybean (Arce et al. 2009). Weed management consisted of a single glyphosate application (1 lb ae/A) applied at different timings. This program was selected since we knew it was susceptible to weed escapes, primarily weeds that emerged following the glyphosate application. As soybean seeding rate increased the amount of weed biomass decreased. Since waterhemp seed production is closely related to biomass, higher soybean seeding rates also reduce weed seed production. The relationship between seeding rate and weed growth probably would have been much less evident if we had used sequential glyphosate applications, the standard program during the heyday of Roundup Ready soybeans. The evolution of glyphosate-resistant weeds doomed that simple system, creating the need for alternative tactics. Figure 1. Relationship between soybean population and weed biomass. Arce and Hartzler. 2009. The phrase ‘many little hammers’ has been used to describe weed management systems that use multiple tactics, each providing relatively small contributions (compared to herbicides). Due to the spread of herbicide resistant weeds, we are now using herbicides much less effective than glyphosate. These herbicides would benefit from other tactics that contribute to weed control. Increased seeding rate is a tactic easily incorporated into systems of growers planting soybean in narrow-rows, and offers an opportunity to include another ‘little hammer’ in the production system. Another thing to consider is that the soybean seeding rates recommended by most agronomists are based on single year economics. Weed management needs to be viewed as a long-term issue since weed seed produced by weed escapes impact future management. While the enhanced suppression provided by higher seeding rates may not enhance soybean yield that year, the long-term benefits due to improved weed control, lower weed management costs, and reduced risks for resistance should be considered. So what is the optimum soybean seeding rates for growers using narrow-row soybean? If a grower is able to consistently maintain full-season control at the lower recommended seeding rates, they could probably continue with this approach. However, they should scout fields closely to detect any weed escapes. Growers that struggle in maintaining full-season weed control probably would benefit from increasing their seeding rates (if they are at the current seeding rates). As with every aspect in crop production, there is no ‘one-size fits all’ approach and individual needs will vary from farmer to farmer and even between individual fields on the same farm. Arce, G.D., P. Pedersen and R.G Hartzler. 2009. Soybean seeding rate effects on weed management. Weed Technol. 23:17-22. DeBruin, J.L. and P. Pedersen. 2008. Soybean seed yield response to planting date and seeding rate in the upper Midwest. Agron. J. 100:696-703.